See more objects with the tag collectors, putti, royalty, designers, canopy, feathers, ornate, print collectors, printmakers, ostrich, aristocratic, beds. See more objects with the color bisque grey darkgrey darkslategrey dimgrey or see all the colors for this object. This is a Print. It is dated ca. 1702 and we acquired it in 1988. Its medium is etching, engraving on white laid paper. It is a part of the Drawings, Prints, and Graphic Design department. 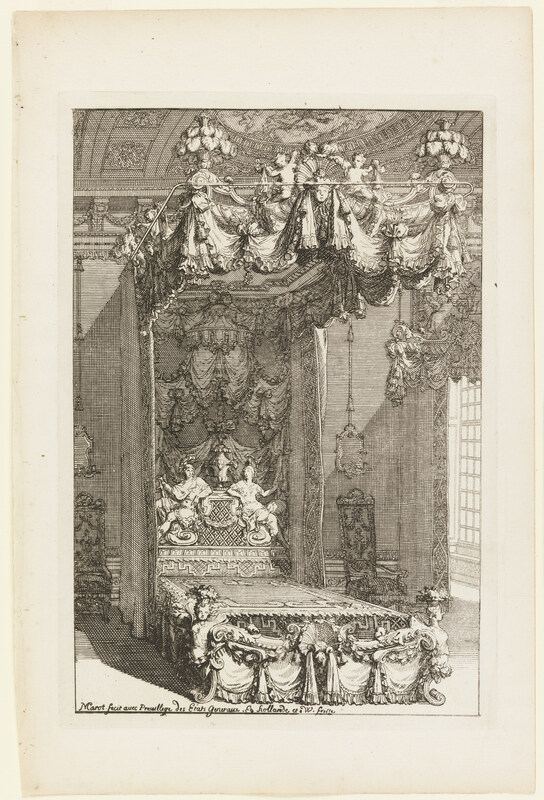 An ostentatious bed dominates in this etching by Daniel Marot, the French designer and architect who served as the chief designer to William of Orange, later King William III of England. This design is for a state bed (lit d’apparat), which was purely ceremonial rather than functional, and kept in royal palaces and country residences in the event of a visit from a monarch At the center of the canopy, two putti present a large classical mask. The headboard features an ornate design composed of two classical figures, likely Minerva, seated below a tent-like motif. Putti with baskets frame the foot of the bed and the bed skirt echoes the cresting of the tester. To the right is a doorway with an equally elaborate canopy and light streams in from unseen windows. 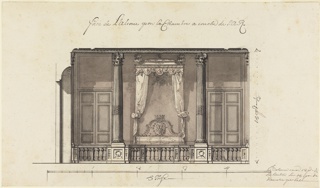 This is one of several designs for state beds in Marot’s Second Livre d'Appartement. The state bed would have been one of the costliest items in state apartments due to the high price of the textiles involved. Marot’s design offers a glimpse at a time when beds, alongside other items of interior furnishings, were integral aspects in courtly ceremony. This object was featured in our Object of the Day series in a post titled A Bed for a King. Inscribed on plate lower edge: Marot fecit avec Pre...[illeg.] des Etáts Generaux. En hollonde et W. [illeg. ].